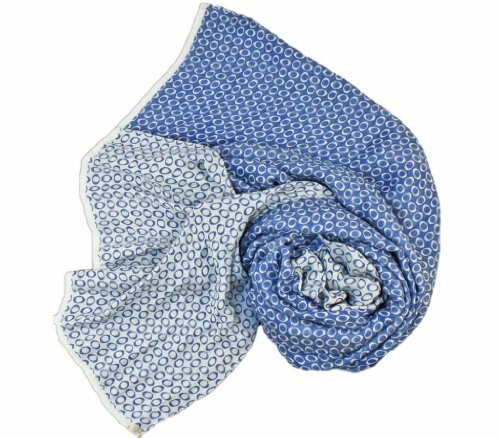 Made in Italy of 70% silk & 30% viscose rayon, the Stanley Lewis Orbit silk scarf in cobalt blue has a reversible pattern with a fresh sky blue and cream pattern on one side, while the reverse side features the soft cream base color with a sky blue pattern. The lustrous combination of silk & viscose rayon ensures maximum draping, and the generous use of fabric allows for a full, voluptuous effect. The inspirational designs of these Italian scarves make them an important inclusion for the men who consider style a key element in dressing. About Us: The Stanley Lewis collection of gentlemen's accessories features a compilation of the finest and most exclusive men's fashion accessories in the world. Uniquely designed, all products are Made in Italy by the most revered craftsmen and includes a superlative range of handcrafted accessories, all perfectly presented in seductive handmade packaging. Stanley Lewis gentlemen's accessories work effortlessly with others in the collection to bring a creative, thoughtful, dapper polish to even the most uninspired button-down and trouser combination. 70% Silk & 30% Viscose Rayon Measures 75" x 26"
If you have any questions about this product by Stanley Lewis, contact us by completing and submitting the form below. If you are looking for a specif part number, please include it with your message.